Lifetime Dental Health (Columbus) - Book Appointment Online! 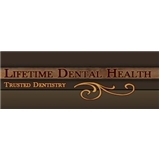 Welcome to Lifetime Dental Health-you have come to the right place! At our Columbus dental practice, our goal is to keep your teeth healthy for life, which requires a life-long relationship with a dental practice built on trust. Dr. Barry and Dr. Love are Columbus, Ohio dentists with extensive experience and training in all aspects of dentistry. Most important, our Columbus dentists are here to serve you and your family.